Recently, I watched Snow Falling On Cedars (1999) and took note in particular of the courtroom scene where Kazuo Miyamoto—the young Japanese-American on trial for the alleged murder of fisherman Carl Heine, Jr.—is interrogated by the prosecuting attorney. Set during the aftermath of the bombing of Pearl Harbor, the prosecutor seizes upon Miyamoto's taciturnicity and characterizes it as an unemotional and coldblooded lack of remorse, playing upon prevailing anti-Japanese sentiment in his attempt to persuade the jury that Miyamoto's inscrutability is part and parcel of what is not to be trusted in the Japanese people. The defense attorney, of course, rightfully objects to this racial profiling. I kept thinking of this courtroom scene while watching Zhang Yimou's Qian li zou dan qi / Riding Alone For Thousands of Miles (2005), in the sense that what is characterized as the inscrutability of the Japanese countenance is, in truth, a culturally nuanced mask worn by individuals as an expression of honor, and dignified reserve. These culturally-conditioned personas and the masking of feeling courses predominant through Yimou's quiet, powerful feature, shuffled like a whisper between shouts or—as Twitch critic Peter Martin states it—a "painting on a smaller canvas than his previous two pictures" (or, judging from the trailer, his upcoming Curse of the Golden Flower). 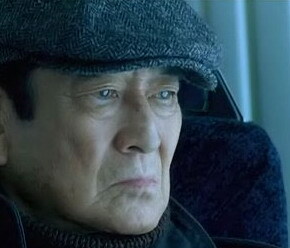 As the press notes synopsize: "For the first time in many years, Gou-ichi Takata (Ken Takakura) takes the bullet train to Tokyo from the quiet fisherman's village where he lives on the northwest coast of Japan. His daughter-in-law, Rie (Shinobu Terajima) telephones to tell him that his son, Ken-ichi (Kiichi Nakai) is seriously ill, and asking for his father. "But when he arrives in the city, Takata finds that Rie was not entirely truthful: Ken-ichi has been hospitalized, but after years of painful estrangement, he still refuses to see Takata. Crushed, the old man quietly slips out of the hospital, but not before Rie gives him a videotape to watch. Rie hopes what Takata sees on the tape will help him get to know his son again. "Takata plays the tape and learns that Ken-ichi is studying a form of Chinese folk drama that dates back more than a thousand years. Ken-ichi had traveled all the way to Yunnan Province in Southern China to see the famous actor Li Jiamin perform, but the actor was ill and unable to sing. Li promised to sing the legendary song 'Riding Alone For Thousands of Miles' from the literary classic Romance of the Three Kingdoms for Ken-ichi if he returns to Yunnan the following year. "Hoping to bridge the gap between himself and his son, Takata decides to find Li Jiamin and videotape his performance for the dying Ken-ichi. 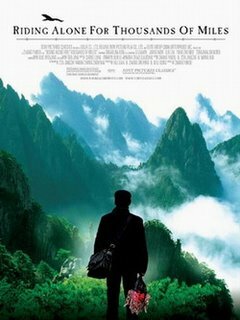 As the old man begins an odyssey into the heart of China, he encounters a number of strangers who color his journey—from well-meaning translators who guide him through China's idiosyncrasies, to prison wardens anxious to promote Chinese culture abroad, to a young runaway with a complicated father-son relationship of his own. What Takata discovers on his journey is kindness … and a sense of family he thought he had lost long ago." Almost immediately as I watched Takata on the phone with his daughter-in-law Rie, I wanted to rail against his inability to express his emotions. I felt he was selfish for giving nothing by way of sympathy or comfort to Rie, whose husband was dying in the hospital. I couldn't understand at first why she would even bother trying to mend the rift between her husband and his estranged father. But as the movie progressed I began to feel the weight of Takata's suppressed emotionality, its immense and intense depths, and its dire consequences not only for himself but for those he loves. It wasn't as if he didn't know how he couldn't express his feelings, and his self-knowledge only added to his heart's overburdened cargo. The film is punctuated by admissions he concedes to himself in reflective voiceover. Riding Alone For Thousands of Miles is illuminated—as with so many of our lives—by regret and clear hindsight. The masks are multiplicit as Takata travels through the Yunnan Province, searching first for the famous actor Li Jiamin and then Li Jiamin's son Yang Yang. Takata's journey to videotape Li Jiamin's performance for his dying son unapologetically replicates the story of Guan Yu, the protagonist of the ancient Chinese tale from Romance of the Three Kingdoms. The mighty general Guan Yu became a symbol of loyalty when he refused titles and riches to ride thousands of miles in order to help a friend. Takata's inability to express his feelings is not the only mask. There is also nature in its full panoramic beauty filmed to serene perfection by Zhao Xiaoding. There is the nearly comic impenetrability of foreign languages, the mistranslations of intent, and the miscommunications that realign the efforts towards communication, let alone the dropped calls of cellulars in remote no-zones. One of the film's most endearing balances of humor is when Takata is taken to the tiled rooftops of the Stone Village in order to find a signal to make a phoned plea for translation. By witnessing Li Jiamin's unabashed tears for his own son and the Stone Village's generosity when they receive Takata as a visitor (in a truly memorable banquet scene), Takata is forced to acknowledge the limits of his own laconicity and his own abbreviated gestures of reciprocity. Thus, the culturally-nuanced countenance of the human face and heart, language, and the seeming indifference of grand, beautiful nature all serve as masks that conceal and reveal in equal measure. There is, of course, the obvious masks of Chinese opera performance as well. The beauty of Zhang Yimou's film lies precisely in that purposeful tension of masks between what is concealed and what is revealed or, to paraphrase mythologist Joseph Campbell, these are masks transparent to principles of transcendence. When the mask weeps, the world of appearances is torn asunder. Ken Takakura personifies and holds that tension brilliantly. Zhang Yimou has wasted no words attesting that the film was tailor-made for his childhood idol Takakura and that it has been his dream to work with this seasoned Japanese actor who has often been dubbed Japan's answer to Clint Eastwood on account of his silent charisma. 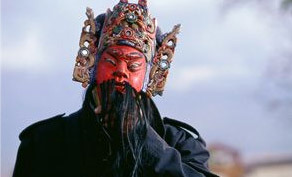 Providing Takahura with a lean script and surrounding Takahura with his customary use of non-actors, Yimou achieves a striking and direct truthfulness in the film's performances. Teetering on the edge of melodrama, the film manages to maintain its balance and to achieve an effect of deep understated heartfulness. This is a balancing act that Yimou has come to master in his "smaller paintings." It's necessary to note as well the perfect casting of nine-year-old Yang Zhenbo as Yang Yang, chosen from nearly 70,000 children! This distillation of casting has introduced a mischievous child whose distrustful stubborn-smudged face you love immediately and whose plight you embrace as tightly as Takata does Yang Yang during the film's denouement when, finally, nothing is hidden, the themes are readily apparent, and the heart's true countenance is exposed. ... sometimes, I wonder whether I'm the only person in the world who doesn't like Riding Alone For Thousands of Miles. That I've became so cynical that I frowned at the ending scene (where everyone in the prison wept), and getting annoyed with the little kid (and this comes from a guy who LOVES children). Sure, there are some comical parts (the village elders, in their lengthy discussion), but there is just something too manipulative about it. It's as if Zhang Yimou was going... "AHA! BEGIN TO WEEEEEEP!" at various scenes. Oh, I am sure you are not the only one who doesn't believe Yimou has pulled off his melodramatic balancing act, not only in this film but in others. But we can agree to disagree. this would be a logical explanation.